a quick show and tell of the Balcony Rock boulders and cliff to educate the rest of the group. After the quick tour, we moved on to The Tiers to start our day. We warmed up on the third tier and climbed Canal Blues, An Unlikely Warrior, Sandy Hook Special, Cindylicious, and Untapped Rage. We then dropped down to the second tier and climbed The Company Store, Mule Powered, Nancy, Coal Wars, Baldwin Thugs, and Just My Fancy. Courtney finishing up Mule Powered while Greg spots. The Company Store is to her left and Nancy is around the corner to the right. After doing those problems we dropped down to the lowest tier, Tier 1, to get on the highest quality highball classics of the Tiers. We climbed John Browns Body, Isaac Smith Arete, The Secret Six, and Pocket Slab. The Secret Six, to my knowledge, had never seen a second ascent. It is a problem that is difficult to photograph and difficult to describe or "see" without being there in person. This day was the perfect opportunity to get the word out about this classic yet little known problem. 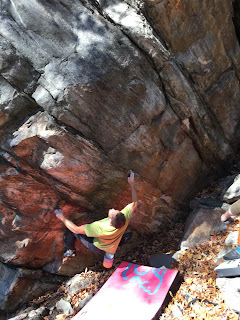 Scott Chapman crimping and squeezing his way to the top of The Secret Six. Steve E getting high on John Browns Body. Steve E entering the crux section of Isaac Smith Arete in his... chili pepper tights. Nice! Drew waits on top while Jeff B. gets near the top of John Browns Body. After successful sends of John Browns Body and Isaac Smith Arete by nearly everyone in our group, we packed up and headed to the Highlands. Courtney and Greg split off to sample the rope climbing on Balcony Jr. while the rest of us kept bouldering. Scott and myself split off to quickly sample Little Dipper, Big Dipper, and Orions Belt on the Starlight Boulder before heading over to Stinger Arete. The rest of the boulderers hit the Struth boulder and targeted Smooth Sailing to get a grade consensus after a crux hold had broken a while back. They also sampled the other problems on that boulder. We then rejoined at the Big Time Boulder to take a stab at Learning To Fly. This problem has only seen one ascent as far as has been reported. That will stand for now as not one of us made through the crux. Scott made the best effort but didn't send and soon diverted his attention to the proposed project that exits left to join Dans Arete. He ended up sending that and we are tentatively proposing a V5/6 grade. He is calling it Pigeon Foot after a recent comical incident involving pigeon feet (dead). We then packed up for the main event. Finally, we had arrived at what was the nervously anticipated focus of the day. We were standing under the Iron Pickle on the Throne Boulder in the upper Highlands on Elk Ridge, MD with lots of pads and spotters as well as perfect weather and warm muscles. The only question was would our nerve stay with us as we moved higher on the boulder. For two of the six, the answer was yes; For the rest of us, we were happy with valiant attempts. Scott C. sent on his first try and looked very solid. This injected inspiration and guts into the rest of us but Drew was the only one to convert. He fired it and all while wearing his elf hat. I'm not sure if he was more excited to be topping out or to have done it in his elf stocking cap. It was definitely a source of shared laughter. Good job to both guys on their ascents. Here is a single photo of each of us having a go. Thanks go to Coco Boan for these next photos of the Iron Pickle attempts. Drew on his send of the Iron Pickle. 2 of 3 sequence - Steve E.
After all of this highball action Scott and myself split off to hit the main face of Maryland Heights and climb Hard Up Direct. We retrieved our trad gear and dumped our bouldering gear. We ran into town and registered with the National Park Service, as is required, and then headed to the base of the wall. Please enjoy these photos of our ascent. Scott shoeing up for the first pitch. Scott leading up the bottom of the first pitch. Scott at a trad anchor he built at the top of the second pitch, which we strung together with pitch 1. He missed the chains that are just a few feet below where he is sitting. Conrad climbing up to Scott who is sitting at the anchor at the bottom of pitch 3. Sitting at the chains at the bottom of pitch 3. Beautiful day from high on the wall. Turning the corner to meet Scott at the belay where this route meets the D Route. Scott leading up through the chimney. Another beautiful view from high on the wall. Thank you for tuning in. 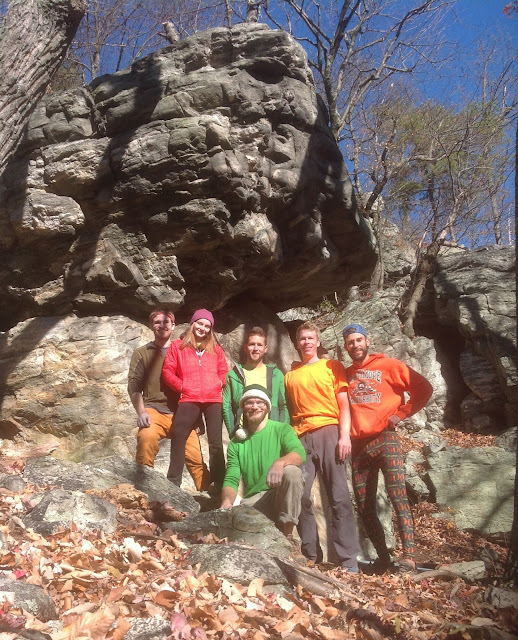 I will be doing more posts on a few of the high quality boulder problems mentioned above. I'll break down the problems and show movement sequences as a way of sharing beta with everyone. Hope you enjoyed the post. Get out there with friends and enjoy.